Digital Forsyth | Quality Oil Company. Shell Service Station at 817 W. First Street at Green Street. Home › Photos › Quality Oil Company. Shell Service Station at 817 W. First Street at Green Street. Quality Oil Company. Shell Service Station at 817 W. First Street at Green Street. Quality Oil Company. #23 Shell Service Station at 817 W. First Street at Green Street. Station operated by Whitlow. Photo made in the 1950s. 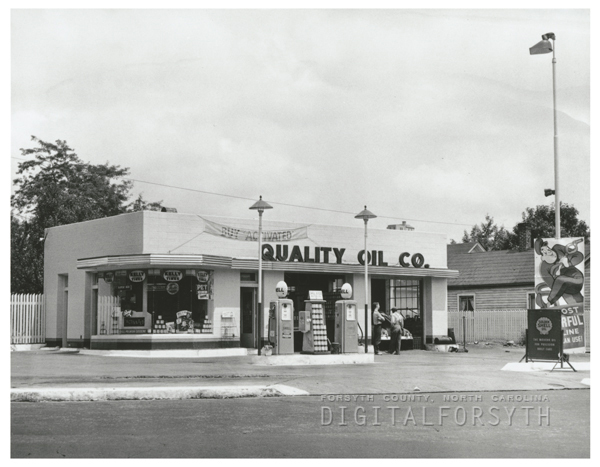 The Quality Oil Company granted permission to the Forsyth County Public Library to reproduce these images for the collection and to make them available on Digital Forsyth.